The Times newspaper said London had agreed in talks with Brussels to give UK financial services firms continued access to the bloc. The pound has risen 1% against the dollar in response. But a government source said that was "a rather rose-tinted interpretation of where we have got to". The source told the BBC: "People shouldn't get ahead of themselves." The Times said in its report that an initial deal on exchange of data had also been agreed. It added the deal was expected to be completed within three weeks. Sterling rose on hopes of an agreement, with the pound up by more than a cent against the dollar at $1.2887. 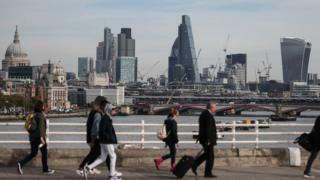 Britain's departure from the European Union is expected to take place in March next year, but many UK-based businesses have expressed concern over the lack of progress in Brexit talks. Despite various reassurances from Prime Minister Theresa May that definite trade terms between firms in the UK and the EU will be finalised by March next year, businesses across the board are already preparing for the worst. Mrs May's senior adviser on Europe, Oliver Robbins, was continuing the negotiations in Brussels, The Times said. Equivalence - the apparent basis of Theresa May's reported deal with Brussels on financial services - sounds like a cuddly continuation of what the City has now. It is not. In this context, equivalence is a legal term describing the regime the EU uses when dealing with countries outside its boundaries. The EU grants equivalence to other states if it can be persuaded that its rules are the same as the ones set by Brussels. Equivalence, and the trading rights that come with it, can be withdrawn at any time. That is why when one of the big City law firms, Hogan Lovells, was asked to look at equivalence by the City UK, the trade body for the Square Mile, its conclusion was that it did not "provide a long-term sustainable solution". What we do not know, however, is whether Mrs May has managed to negotiate some kind of "equivalence-plus", with the kind of safeguards that would ease City fears. In any event, reports of any kind of deal were enough to rally sterling, and even those unhappy with the idea of equivalence would concede that it is probably better than no deal at all. According to the newspaper's report, the deal means that after Brexit, UK financial services companies will be able to operate within the EU as they do now. The Times said the EU would accept that the UK had "equivalent" regulations to Brussels and would therefore be allowed market access. However, there has been no official confirmation of the report. Thomas Moore, investment director of UK equities at Aberdeen Standard Investments, told the BBC's Today programme that if true, "I think on balance, it's positive." He said the granting of equivalence, much desired by the City, "produces much greater certainty, not just for financial companies". What's the latest on the UK-EU Brexit deal talks?